Blue Waters Resort is an established, family owned hotel on the northeast corner of Antigua, set within 17 acres of tropical gardens wrapped around Soldiers Bay. The luxury resort provides the highest standard of service with a warm welcome and friendly atmosphere. Blue Waters was named 'Antigua's Leading Hotel' at the 2017 World Travel Awards. Blue Waters has the most versatile accommodation on the island, with 67 rooms, 32 suites, 4 villas and 4 penthouses. All of the accommodation caters for luxury living, from the spacious Superior Hillside Rooms and the Cove Suites with their private access to four infinity pools and bars, to its exclusive villas and cottages. Rock Cottage is an exclusive and luxurious option, boasting five bedrooms plus a private infinity pool and outdoor seating areas. Blue Waters Resort offers a range of dining choices in its four restaurants and two additional bars. The Palm Restaurant is open daily for breakfast, lunch, afternoon tea and dinner and overlooks the Caribbean Sea. Bartley’s is a unique, adults-only restaurant where guests can enjoy a romantic evening dining on authentic Caribbean cuisine, included for those staying on an all-inclusive basis. Outside on the cliff top is The Cove Restaurant, where guests can choose to enjoy the breathtaking scenery whilst dining on Caribbean and French cuisine. Carolyn's Beach Bar & Restaurant is the newest addition to the resort's dining options, having opened in January 2017. The restaurant is open daily for lunch, serving light dishes including salads and flatbreads al fresco with views over the sea. The newly built spa at Blue Waters offers a range of massages and other treatments in conjunction with Elemis. There are also seven freshwater swimming pools and three secluded beaches on which to relax, while guests seeking to be more active can make use of the tennis court, gym and take part in non-motorised water sports. Evening entertainment includes the Manager’s cocktail parties and entertainment such as steel pan bands accompanying Sunday brunches.The team at Blue Water’s will also be happy to arrange any tours or excursions that guests wish to go on. Golf is available at the nearby Cedar Valley Golf Course and the concierge team will be happy to book this for you at discounted rates. Blue Waters Resort has a children’s club which allows parents to relax knowing your children will be entertained and supervised. There is a creche for 18 month olds - 3 year olds, a specific club for 4 to 14 year olds and a games room for teenagers aged 14 and above. Blue Waters has to be one of my favourite properties just for the staff, who are super friendly and professional at the same time - they really made my stay and can't do enough for you! Being welcomed with a mango martini, cold towel and the sound of the steel pan has to be one of the best ways to arrive in paradise! The resort feels luxurious and special but is also relaxed and laid back at the same time. There are a number of watersports on offer on the main beach and with 2 other coves to choose from it's really easy to find you own space to chill out. With a variety of accommodations to suit all, from interconnecting rooms for families up to the luxurious Rock Cottage (truly wow! ), this property really does have something for everyone. I particularly enjoyed the Cove Suites as each block has it's own pool and offers stunning sea views, even from the bath! Dining is a treat, with the Cove Restaurant coming out top, but also enjoyed a relaxed lunch at the Palm - you certainly won't be disappointed. Offering a kids club, a fantastic spa, live bands and sporting activities all within easy reach of St Johns, Blue Waters really is paradise! 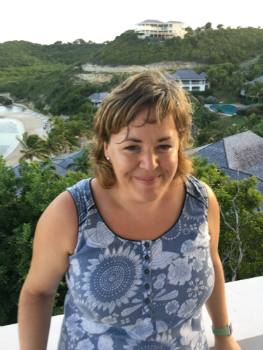 For more information about Blue Waters or alternative resorts, take a look at Karen's Antigua Trip Diary. "The grounds were lovely and the service excellent. Fabulous holiday, the location and service made it very special." Kevin, travelled in February 2019.